Ok so the past few days have been full of busy distractions. We have been preparing some materials for the NTID Tech Symposium, playing around with creating sugar usb sticks, stopping by posse, lunch presentations with the other summer research fellows, getting and setting up our own mini computer lab in the foss box, and much more. There are a lot of great things going on in the innovation center and I am glad to be apart of it! 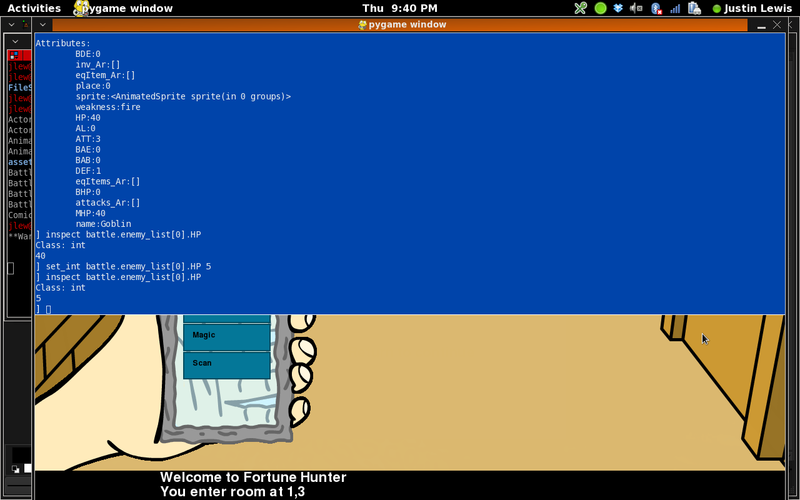 So update with the fortune hunter game engine. I have been working on a feature to allow a dev console to be added to the game (ticket #5). 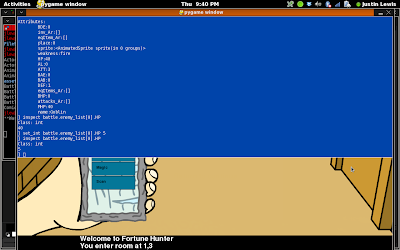 Recently I was able to successfully use the dev console to edit integer and string data. I have been having some problems with this because of the way python is designed. Luckily python still has some leftover global scope functions like hasattr and setattr which were of great use to this ability. The game engine now keeps track of the last element and token when finding the requested object which can be passed to setattr giving us access to modify the object. The next step will to support the ability to create more complex structures then int and strings.